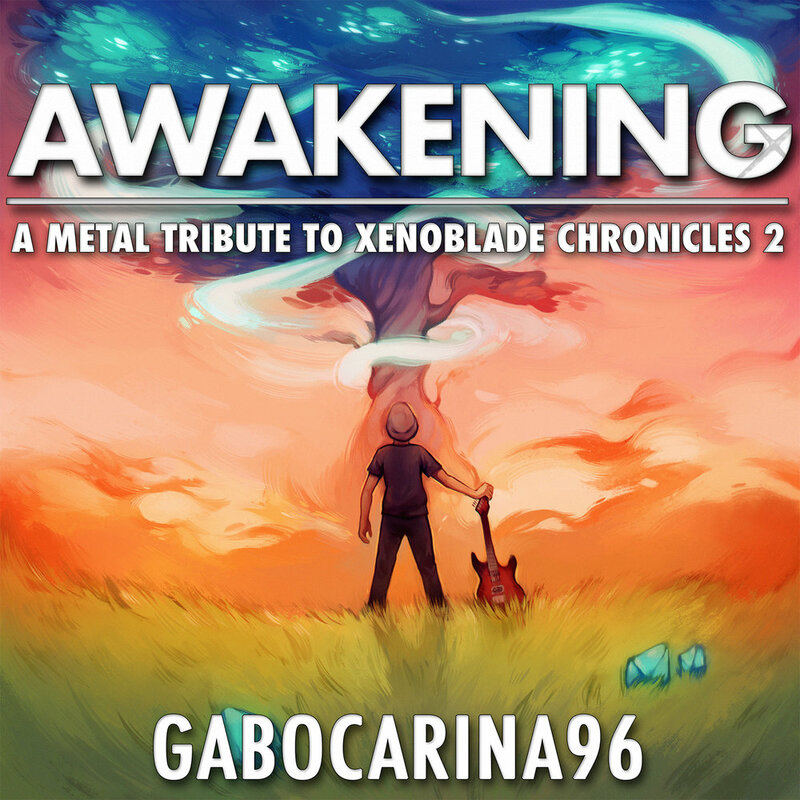 If ripping battle themes, fantastical symphonic elements, and the happiest guitarist in the VGM Cover scene came together, you would get the brand new Awakening: A Metal Tribute to Xenoblade Chronicles 2 album by Gabocarina96. Album Art by Sprouteeh. Stunning isn’t it? Thanks for talking with me today Gab! To start, the album is fantastic and really blends all of your skills as a musician. As someone who has not played the game, what makes Xenoblade Chronicles 2 so special to you, both as a game and a soundtrack? It has the best story I have ever experienced in a video game. I started playing it without too big expectations, me being new to the Xenoblade series at that point. I was quickly blown away by how lovable each characters were, how they developed and how great the story was. The soundtrack was varied and songs played at the perfect moments to convey just the right emotions. Battle themes are epic, field themes are huge and totally make you want to explore the whole world, and then you have the cut-scene tracks that just make you feel things. There’s so much to love! This is definitely the case for a lot of fans! Speaking of the soundtrack, it seems like your viewers enjoyed your Xenoblade Chronicles covers on Youtube as well! How did you take advantage of that? Did it help inspire the album? It was really heartwarming for me to see these covers get all that love and attention as I wasn’t expecting so much from these, to be honest. I started covering those songs because I genuinely loved Xenoblade Chronicles 2 and its soundtrack and I’m still blown away by the feedback it got. The album came as an idea later on when I started getting comments asking for a Spotify release. I was one of them for sure! I really enjoyed your earliest videos with the Xenoblade music, and now you released Awakening! A lot of the album is powerful rock and heavy metal anthems. What were some of your favorite influences or musicians that impact your playing style? My style seems to change a bit with time but always remains as some sort of mix between punk rock and metal. I must admit, I don’t listen to a lot of real music if I can call it that so I’m more influenced by video game soundtracks. Aside from bands like Muse and Green Day of course. Very cool! A lot of musicians in the video game cover community also enjoy bands like that, and you can hear some of that influence in your pop-punk riffs and use of melody! You also record a lot of great softer acoustic or ocarina-driven covers! Do you prefer heavier or softer covers? Thank you! I think I have a slight preference for making rock covers just because I’m more used to it but I do absolutely love making acoustic songs even though I find them to be a bit harder for me. They sure are easier on my ears though! It does make sense that acoustic songs require more setup for microphones and so on, but you definitely make it look easy! Speaking of different songs, what was your favorite song to cover on Awakening? I really loved covering “Bringer of Chaos”! It was right when I started getting more and more requests for Xenoblade covers and I remember being so excited to release it. Definitely up there, though I absolutely love the way Incoming! opens. Given how you covered well over 9 tracks from the game, were there any songs that didn’t get to include on the album? I wanted Awakening to sound the same way from beginning to end, so acoustic songs or collabs (collaborations) were rejected. I thought it sounded weird listening to one after the other with tones being too different. As a result, I decided to go for a compilation of what I thought to be the nine best covers. Also, if I put everything on the album it would feel outdated the second I post a new Xenoblade 2 cover. This is really smart of you, and it definitely shows. The album is through and through the best possible set of covers and nothing feels out of place. Last question, who is your favorite Xenoblade Chronicles 2 character and why? Nia. I absolutely love her sassy personality and character development in the story. Perfect! I appreciate your time chatting with the Gazette about your latest creation and I’ll be jamming to this one for a long time! You can check out Awakening (A Metal Tribute to Xenoblade Chronicles 2) on iTunes, Google Play, and Spotify. Be sure to follow Gab on Youtube for his latest video/music work, and Twitter and Facebook. Music video for “After Despair and Hope”, Track 9 on Awakening: A Metal Tribute to Xenoblade Chronicles 2.